There is lot of activity in the Yolo Bypass Basin these days. When that means critical habitat restoration is occurring in one of the state’s most important systems, all of California benefits. Above, a February 2017 photo overlooking the flooded Yolo Causeway, a 3.2-mile long elevated highway that crosses the Yolo Bypass floodplain, connecting Davis and West Sacramento. There’s a buzz of activity in the Yolo Bypass surrounding crucial habitat restoration projects. One project is essentially finished; another is under construction and four others are deep into the planning process. There is almost too much activity in the Yolo Bypass Basin these days to keep track. But when that means critical habitat restoration is occurring to help fish in one of the state’s most important systems, all of California benefits. 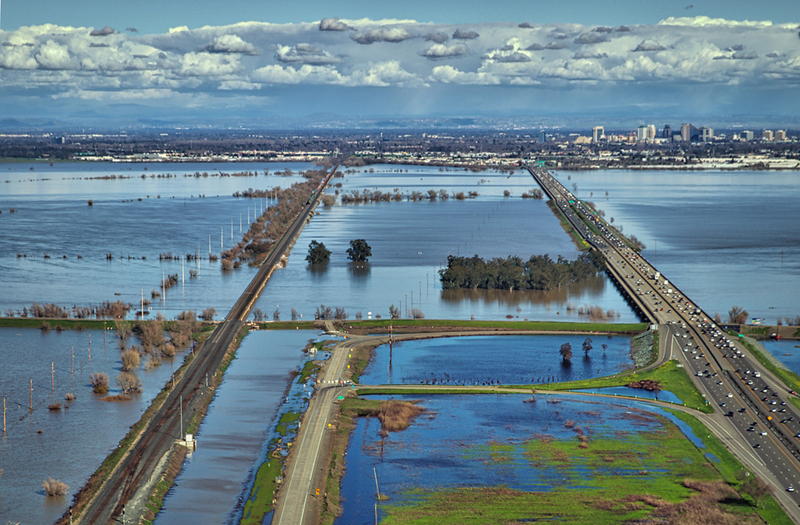 The Yolo Bypass is a critical part of the state’s flood control system, receiving flood waters from major waterways including the American, Sacramento, and Feather rivers. When flooded, the bypass becomes one of the largest seasonal floodplains in the Delta, and a migration corridor for dozens of native fish species including Chinook salmon, steelhead, and green sturgeon. Some of those corridors have become difficult for fish to navigate over the years, however, working on corrections has led to a key collaborative effort between several state agencies led by the California Department of Water Resources and the U.S. Department of Interior’s Bureau of Reclamation. The latest piece of that migration corridor to begin construction is the Fremont Weir Adult Fish Passage Modification Project. 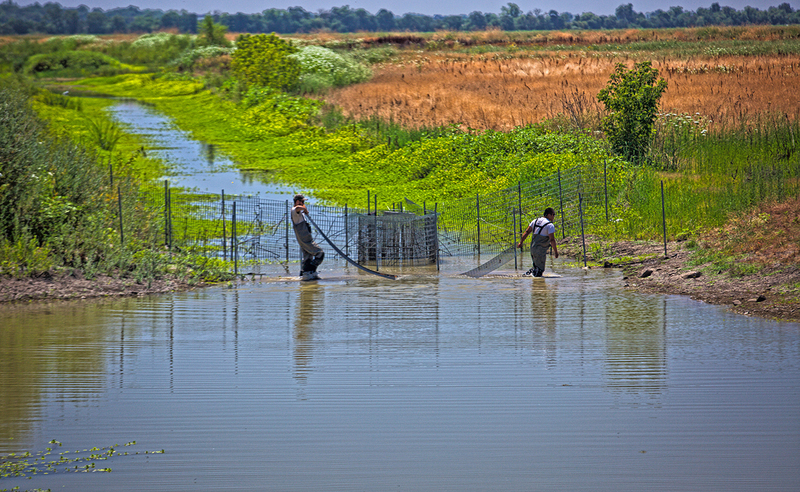 The project complies with the 2009 National Marine Fisheries Service’s Biological Opinion on the Long-Term Operations of the Central Valley Project and State Water Project, which identified the importance of fish passage and floodplain rearing habitat in the Yolo Bypass, requiring the cooperative completion of several projects that accomplish these goals. These Yolo Bypass projects may also potentially improve downstream habitat for Delta smelt, said Heather Swinney, a fish and wildlife biologist for the U.S. Fish and Wildlife Service. Fremont Weir is located near Woodland and West Sacramento in the northern Yolo Bypass area and is a 1.8-mile long concrete structure that will overtop during rain events and allow flow into the Yolo Bypass. Fish become stranded whenever the Sacramento River recedes because an existing fish ladder is too narrow and doesn’t provide adequate depth for fish to pass through the weir. In its current state, the ladder impedes anadromous fish from returning to their spawning grounds. Work began last May and is scheduled to wrap up by the end of the year. The Fremont Weir will improve fish passage conditions in the channel that extends from the existing fish ladder downstream to an existing deep pond by removing one agricultural road crossing and replacing another with a structure that allows for fish passage through the Tule Canal and continued agricultural utility. The Wallace Weir project is just a couple of “minor fine tunes” away from completion, said DWR’s Maninder Bahia, the project manager who has overseen all of the Yolo Bypass projects the past nine years. 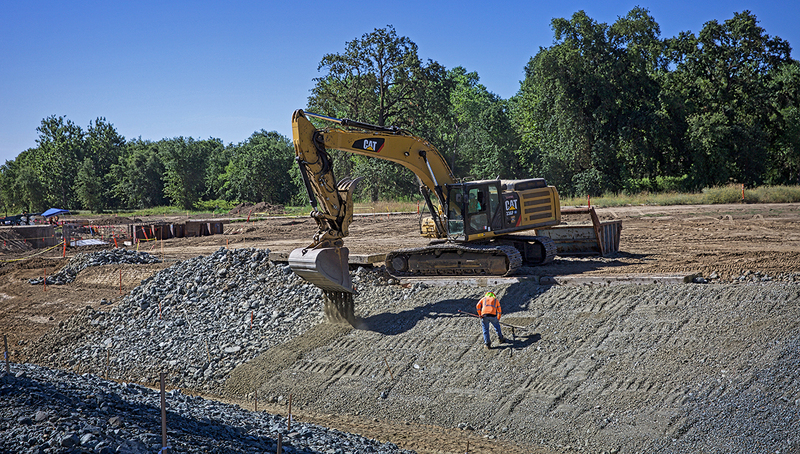 Construction began at Wallace Weir in 2016, and centers around a water control structure on the Knights Landing Ridge Cut where it enters the west side of the Yolo Bypass. The original dam, which washes away during high flow events, was replaced with a permanent structure that will prevent migration of salmon and sturgeon into the Colusa Basin Drain. 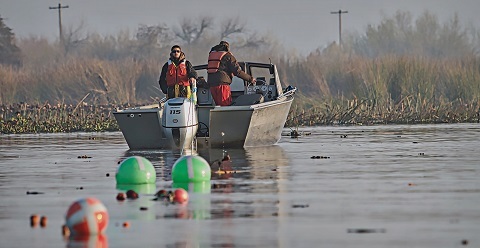 Wallace Weir also includes a facility to allow for efficient trapping and relocation of fish to the Sacramento River, which is currently accomplished by hand during low-water periods by California Department of Fish and Wildlife. Completing that facility is the final piece to Wallace Weir, Bahia said. A road crossing that spans Tule Canal just south of where the Sacramento Bypass connects with the Yolo Bypass, it has also been identified as a fish passage impediment. The crossing provides the ability to impound water for agricultural and waterfowl purposes. Water Resources is in the process of developing early conceptual options to improve fish passage through the Tule Canal in the Yolo Bypass and construction is scheduled to begin in 2019. The project will create a new creek channel that will improve fish passage and native fish habitat where Putah Creek joins and flows through the Yolo Bypass, including seasonally flooded wetlands. 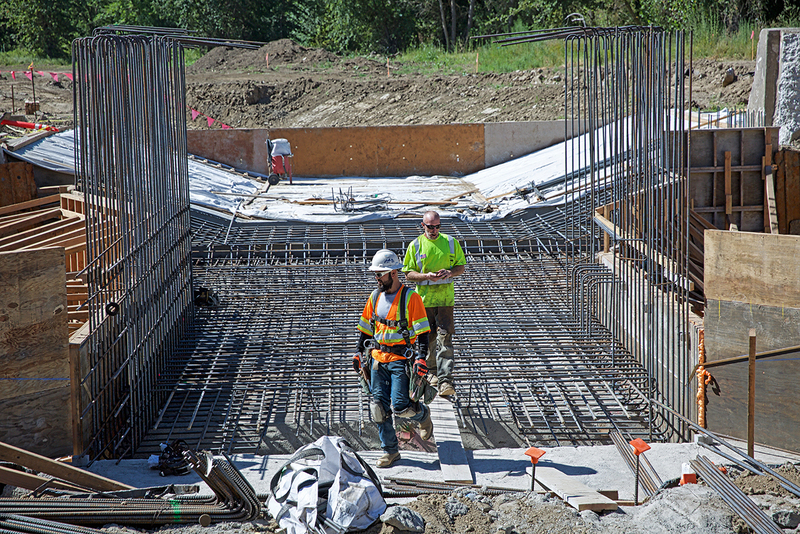 The project will connect Putah Creek with previously restored tidal channels along the Toe Drain and widen and enhance those channels to create tidal habitat and provide better passage for salmon. The project will also improve fish passage to and from spawning grounds on upper Putah Creek by installing a structure that will better control the seasonal timing and magnitude of creek flows. Planning for this project is at the conceptual design level and is scheduled for construction in 2020. Construction is anticipated to begin in 2019 to modify Lisbon Weir, which is considered a key upgrade for adult migrating fish. Lisbon Weir delays migration in the Yolo Bypass. When the bypass is not flooded, salmon can only pass this rock weir when flood tides open a small section of flap gate or when a strong high tide overtops the weir. This project would improve fish passage throughout the tidal cycle while maintaining a reliable agricultural diversion. Planning for this project is at the conceptual design level. 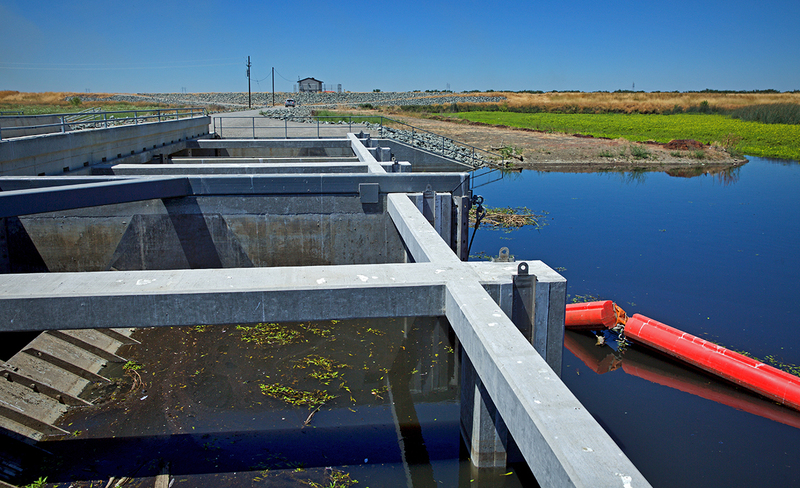 The wide-ranging Yolo Bypass Salmonid Habitat Restoration and Fish Passage Project would primarily consist of a new Fremont Weir headworks structure (structure at the head or diversion point of a waterway), a new outlet channel, and downstream channel improvements. Each of these facilities is a potential outlet channel that will be chosen from the east, center, and west alternatives in the Yolo Bypass. Each channel alignment would terminate downstream into the existing Tule Pond to improve fish passage and increase floodplain fisheries rearing habitat in Yolo Bypass and the lower Sacramento River basin. The project is currently in the alternatives development phase. A public draft Environmental Impact Statement/Environmental Impact Report was released in December 2017 and a final statement/report is expected later this year. Anticipated construction is scheduled for 2020 or 2021.